With over 60,000 products now larding supermarket shelves, consumers need help separating the wheat from the chaff. That’s what the annual “Product of the Year” competition aims to do, heralding 14 of the best of 2010, picked by consumers themselves. But revelers celebrating the 20th annual “Product of the Year” awards were pretty pumped anyway. And why not? I was certainly enthusiastic, given that my witty cocktail repartee was enhanced by the Cinnaminty scent of my breath, thanks to one of the winners. Every year, the Product of the Year awards recognize the household products that distinguish themselves over the 25,000 that are annually introduced in the United States alone. If that sounds daunting, imagine trying to get shoppers’ attention in an average American supermarket, which typically stocks 60,000 items, according to “Supermarket Guru” Phil Lempert, who hosted the evening’s festivities in a sparkly tux. “When times get tough, it’s all about innovation,” he said to the crowd, sitting at tables drinking innovation-enhanced cocktails in which LED-powered ice cubes flickered. While many of this year’s winners seemed, frankly, less breakthrough innovation than brand extension, there were a few stand-outs. 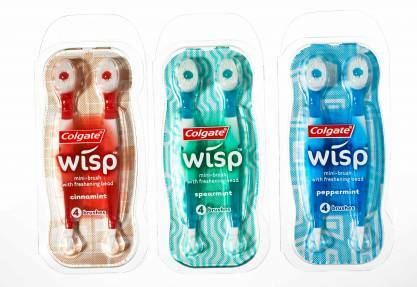 I particularly loved Colgate’s tiny “Wisp” toothbrush, with its bead of embedded toothpaste. Perfect for going from the office to an evening event! Ideal for red-eye flights where you have to brush your teeth on a plane! Super cute! Other winners in the program, which focuses on consumer packaged goods, were Pledge Multi Surface–a cleaner that works on both your dining room table and your flat screen TV , Nescafe Dolce Gusto–a nicely designed single serve coffee machine, Sprite Green–the first soda sweetened with Truvia, Cesar Treats–pet snacks flogged by the cutest dog to shill a product since the late, great Henry (R.I.P.) on the Beneful bag, Moser Roth chocolates–a premium chocolate at a reasonable price and Springfree trampolines–billed as the “world’s safest trampoline.” The winning trampoline team took the stage, jumping, as the Poynter Sisters blared “Jump” on the ballroom’s sound system. Products of the Year earn the right to display their celebrity with the organization’s red seal of approval. “It not only provides a distinguishing mark, but backs that mark with a one-two punch: chosen by other shoppers and ‘new,’ a powerful motivator of trial in a jaded market,” says Herb Sorensen, the scientific advisor for TNS, the research firm that conducted the survey. The Product of the Year survey, started 24 years ago in France, now operates in 28 countries. More than 100,000 American shoppers voted on the products topping this year’s list. To qualify, a product had to demonstrate innovation, and have been launched in the prior year. According to the folks at Product of the Year, the designation is a massive boost to a company’s marketing efforts, increasing retail distribution and sales by an average of 10-15%. Household Products–Glade Sense & Spray by S.C. Johnson & Son Inc.
Home Cleaning Products–Pledge Multi Surface by S.C. Johnson & Son Inc.
Pet Food–Cesar Treats by MARS Petcare U.S.
Children’s Products–Springfree Trampoline by Springfree Trampoline Inc.
Value Products–Moser Roth Choclate by Aldi Inc.